Power Pink - What Do You Think? Great look!! Love the leather pants!! Stunning photos, you look amazing. Looking absolutely stunning, real rockstar combo! УАУ! ОЧЕНЬ КРАСИВО! Ботинки невероятно красивые! 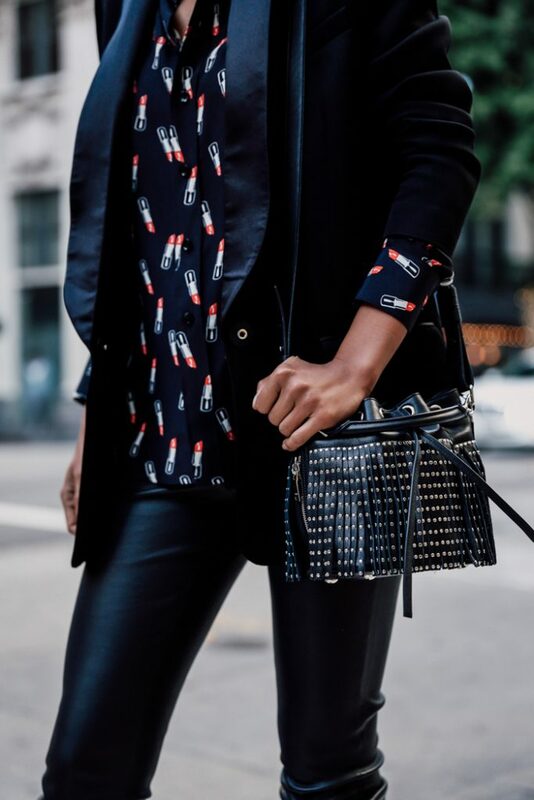 Great graphic blouse, such a fun print! What a super cool outfit! Really like that blouse! Nice bag and so lovely outfit! Beautiful photos! Love the shirt, the print is so cute!! Love the entire look as always. Honey, you're EVER perfect. But, in this post, I'm completely in love with your outfit. Great pants! Love the absolutely stunning leather. I'm also obsessed with your SL boots, they're perfect! Also, the blazer and the blouse, you're wearing, definitely caught my attention! Wooooow I really love this outfit!! The boots, the bag… all is perfect! Congratulations! ! Gorgeous look!! Those boots are amazing!! you look amazing! that saint laurent print is so fun! I love that Saint Laurent did that lipstick print this year. So pretty, I really loved their little camera bag in that print. Love the shirt too but OMG so expensive for a shirt! Really love the edgy vibe of the boots and bag! Cute prints on the top too, very striking piece! Thanks for sharing information about fashion, it very very informative for me. i am waiting for your next blog. Looking very fierce in this! Thanks for Sharing this post.!! Useful Designer Stylish Salwar Kameez Collection..